TORONTO, ON – August 22, 2018 – What are you waiting for? The 2019 Toyota Sienna – the official van of family fun – is ready to go. Sienna offers a choice of power-trains - including the only all-wheel drive minivan models in Canada - plus the advanced safety technologies of Toyota Safety Sense P as standard equipment, and a long list of convenience and comfort features that make every road trip a welcome adventure. New for 2019, the sporty and stylish SE grade is now also available with all-wheel drive. In addition, Apple CarPlay joins Entune as standard gear on all models, making the Sienna a rolling connectivity centre. The difference is immediately apparent, at curbside. Sienna’s styling includes a bold front fascia, a profile defined by sharp character lines, sliding doors on both sides, alloy wheels, power adjustable and heated exterior mirrors and a rear spoiler. Inside, the cabin is spacious and comfortable, with plenty of glass to let in the light and make Sienna feel airy and open. There’s room for seven or eight adults – depending on model – and four anchors for child safety seats. Even with every seat in use, there’s still plenty of space for everybody’s suitcases, too. A long list of comfort and convenience features standard to all models includes three-zone independent climate control, front row captain’s seats, one-touch 60/40 split and stow third-row seat, ECO indicator, outside temperature gauge, power door locks with keyless entry, a conversation mirror, power windows with auto up/down on all windows, rear privacy glass, steering wheel-mounted audio controls and voice recognition controls, tilting/telescoping steering column, plenty of thoughtful in-cabin storage, three 12v power outlets for personal electronics and retained accessory power, cruise control, cargo area tie-down rings and shopping bag hooks. Eight person models feature a 40/20/40 split second-row seat with removable centre stow seat/console, while seven person models are fitted with a pair of captain’s seats in the second row. New for 2019, all Sienna models are standard equipped with Apple CarPlay, which seamlessly connects an iPhone to the car’s built-in display. This feature joins Entune 3.0 Audio to create a minivan that’s also an impressive connectivity centre – with access to traffic information, weather, Slacker, Yelp, sports and stock market results, fuel prices and more, plus Scout GPS Link smartphone-based navigation tools. LE and SE grades include Entune 3.0 Plus: In addition to Scout GPS Link and Entune App Suite Connect, this adds Entune Safety Connect with automatic collision notification, stolen vehicle locator, emergency assistance button and enhanced roadside assistance. XLE and Limited grades feature Entune 3.0 Premium Audio: This includes all the features found in Entune 3.0 Plus, but replaces Scout GPS Link with Embedded Navigation and adds Entune Destination Assist. Under the hood, all Sienna models are built around a 296 horsepower 3.5L six-cylinder engine enhanced with Variable Valve Timing with intelligence and other systems to boost power across a broad range of engine speeds. This is mated to an eight-speed automatic transmission with lock-up torque converter for smooth, confident acceleration and optimized fuel efficiency. Electric power steering is responsive and efficient, while an independent front suspension and torsion beam type rear suspension provide a smooth ride and engaging road feedback. All-wheel-drive models ride on run-flat tires. For 2019, XLE AWD and Limited AWD models have been upgraded to include a towing package with a 1,585 kg (3,500 lb) rating. As popular people haulers, safety is often top of mind when buying a minivan – and with the 2019 Sienna, peace of mind is built in. Every Sienna is standard equipped with Toyota Safety Sense P. This bundle of active safety technologies – including the Pre-Collision System with Pedestrian Detection, Lane Departure Alert with Steering Assist, Automatic High Beams, and Dynamic Radar Cruise Control – enhances driver capabilities to mitigate collisions, stay in lane, and see at night. 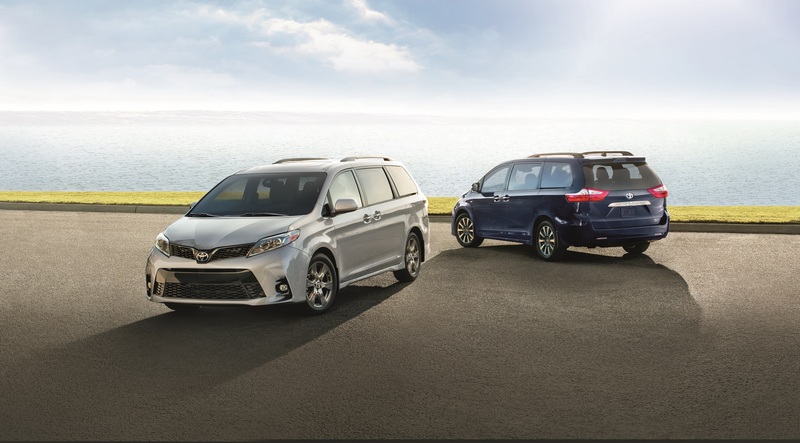 Other safety technologies standard on all Sienna models include the Toyota Star Safety System, eight airbags, active front headrests with whiplash protection, a back-up camera, a tire pressure monitoring system, and more. The 2019 Toyota Sienna 7-Passenger (Starting MSRP: $35,145) provides impressive value in a minivan, with an extensive list of features as standard – including Entune 3.0 Audio, a 3.5” LCD display, all-season floor mats, 17” five-spoke alloy wheels, roof rails, and projector style halogen headlamps. The 2019 Toyota Sienna LE 8-Passenger (Starting MSRP: $38,550) is a popular passenger hauler. Standard features include an 8” Display Audio system, Entune 3.0 Plus, easy-clean fabric seats, heated front seats, eight-way power adjustable driver’s seat, a 3.5” LCD display, electrochromatic rear view mirror with integrated compass, a 120v accessory power outlet, sunshade on rear door, scuff plates, a front centre console box and integrated garage door opener. This model’s bold exterior styling includes power dual rear sliding doors, rear bumper protector and chrome grille surround. The 2019 Toyota Sienna SE 8-Passenger (Starting MSRP: $42,545) gives the Sienna a touch of sporty style – and performance, with sport-tuned front and rear suspension systems, sport-tuned electric power steering, sport gauges, unique grille and unique 19” six-spoke alloy wheels. New for 2019, this model now includes the Blind Spot Monitor and Rear Cross Traffic Alert safety systems – previously only offered with the Technology Package upgrade. This model’s feature list includes an 8” Display Audio system, Entune 3.0 Plus, leather seating, eight-way power adjustable driver’s seat, four-way power adjustable front passenger’s seat, a leather-wrapped steering wheel, 4.2” multi-information display, chrome outer and inner door handles, illuminated front cup-holder, a 120v accessory power outlet, front windshield acoustic glass, power rear door with jam protection, fog lamps, LED rear tail lamps and LED daytime running lights. This model may also be ordered with the available Technology Package (Starting MSRP: $48,360). New for 2019, this package now includes a JBL Premium Audio system with 10 speakers featuring Clarifi technology. This joins Entune 3.0 Premium, plus a dual-screen rear seat BluRay entertainment system with two sets of wireless headphones. Other upgrades in this package include the Smart Key System with power back door button and Push Button Start, a power moonroof, and an anti-theft system. The 2019 Toyota Sienna LE AWD 7-Passenger (Starting MSRP: $41,350) boosts all-weather driving confidence as Canada’s only minivan with all-wheel-drive. Features include an 8” Display Audio system, Entune 3.0 Plus, easy-clean fabric seats, heated front seats, eight-way power adjustable driver’s seat, a 3.5” LCD display, a 120v accessory power outlet, electrochromatic rear view mirror with integrated compass, sunshade on rear door, scuff plates, a front centre console box and integrated garage door opener. Exterior styling includes power dual rear sliding doors, 18” 10-spoke alloy wheels, rear bumper protector and chrome grille surround. New for this year, the 2019 Toyota Sienna SE AWD 7-Passenger (Starting MSRP: $51,220) combines sporty style and all-wheel-drive confidence, then adds a healthy dose of in-cabin technology. Performance upgrades include a sport-tuned front and rear suspension systems and sport-tuned electric power steering. These are matched with sport gauges, a unique grille, smoked headlamp surround and unique 18” alloy wheels. This model’s feature list includes an 8” Display Audio system, Entune 3.0 Plus, leather seating, eight-way power adjustable driver’s seat, four-way power adjustable front passenger’s seat, a leather-wrapped steering wheel, 4.2” multi-information display, chrome outer and inner door handles, illuminated front cup-holder, a 120v accessory power outlet, front windshield acoustic glass, power rear door with jam protection, fog lamps, LED rear tail lamps, and LED daytime running lights. The 2019 Toyota Sienna XLE AWD 7-Passenger (Starting MSRP: $46,785) combines the confidence of all-wheel-drive with impressive comfort and premium features. This model features an 8” Display Audio system with Entune 3.0 Premium, leather seating, eight-way power adjustable driver’s seat, four-way power adjustable front passenger’s seat, power flip-out side rear windows, wood grain trim, leather-wrapped steering wheel, the Smart Key System with power back door button and Push Button Start, a 120v accessory power outlet, the Blind Spot Monitor and Rear Cross Traffic Alert safety systems, rear parking assist sonar, anti-theft system, 18” 10-spoke alloy wheels, power moon roof, projector style halogen headlamps, fog lamps, and LED daytime running lights. This model may also be ordered with the available Limited Package (Starting MSRP: $53,985) for the ultimate in luxury and comfort. This package includes a JBL Synthesis Audio system, dual-screen rear seat BluRay entertainment system with two sets of wireless headphones, premium leather seating, eight-way power adjustable driver’s seat with memory system, leather-wrapped and heated steering wheel, the Birds Eye View Monitor system, front and rear parking assist sonar, 18” 10-spoke alloy wheels, exterior mirrors linked to seat memory with integrated signal lamps, puddle lamps and reverse auto-tilting function, dual power moon roof, rain-sensing wipers and high-intensity discharge headlamps with automatic high beam function. The 2019 Toyota Sienna is also available in two mobility models – at the LE and XLE trim levels – featuring Entune and Toyota Safety Sense P and loaded with standard convenience features such as power dual sliding side doors and a power rear door with jam protection. Through the Toyota Mobility Program, Toyota Canada works with several mobility specialists to provide a conversion allowance and additional accessibility conversion options – including a lift-up power mobility seat or fully accessible ramp conversions including automatic suspension kneeling, automatic ramp, lowered floor and removable seating. See www.toyota.ca/sienna for details and links to partners. The 2019 Toyota Sienna is now on sale at Toyota Dealers across Canada. For complete and up to date details and specifications, visit www.toyota.ca/sienna.